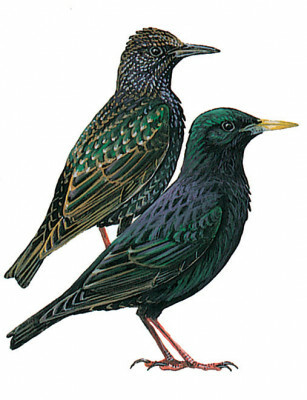 A starling with blackish plumage with prominent white spots. The short tail and short pointed triangular shaped wings are characteristic in fast, straight flight. Walks quickly when on the ground. Juvenile is drab brown all over, with a blackish straight bill and dark loral streak.